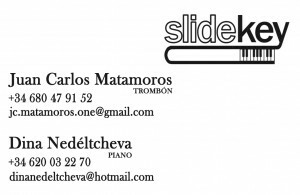 Slidekey Duo arises from the interest of its two members for sharing the traditional repertoire from a different point of view, combining the rich sound of the piano with the strong power and brightness of the trombone. On one hand we have Juan Carlos Matamoros, a young Spanish talent developing his solo career in perhaps the most prestigious orchestra of our country, the Spanish National Orchestra, while devoting his free time to perform recitals and recordings both in Spain and beyond our borders. 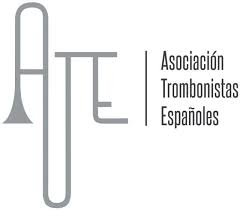 Without going further, in January 2015 he premiered at the National Auditorium of Madrid the new work of Francisco Coll, Tapias, a concert for trombone and orchestra composed expressly for the soloist. However the trombone alone would be naked, so it needs the continued support and warmth of Dina Nedéltcheva in the piano. This excellent pianist born in Bulgary and settled in Spain is developing an intense teaching and chamber music career with prestigious international soloists and groups, performing all over the globe in countries like USA, France or Germany. With these few brushstrokes we get an idea of what to expect when putting together the experience and quality of both soloists, coming together to give us a program full of contrasts, travelling through time from the old Renaissance to the subtle harmonies of Piazzola or Bizet. In this trip we will find known melodies and classical repertoire, but with the incredible quality and spectacular sound of this unusual group. 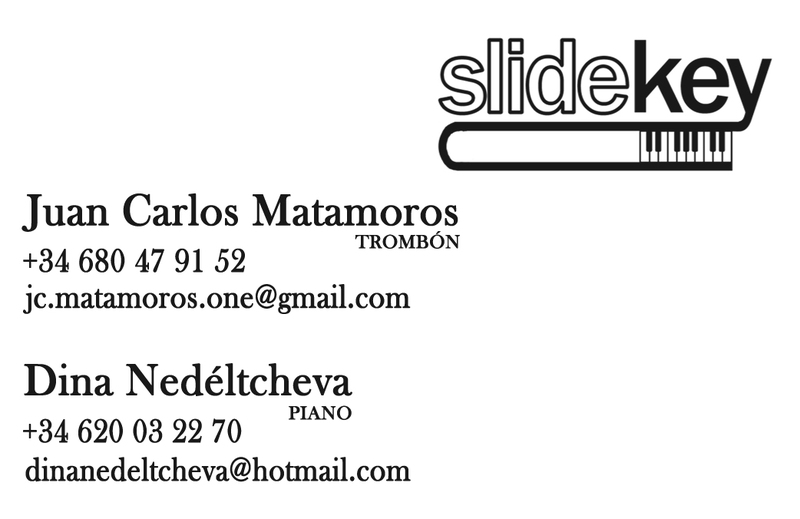 Slidekey is a sonic journey through time with music, a thrilling experience to enjoy guided by the dazzling taste and knowledge of Juan Carlos Matamoros and Dina Nedéltcheva.